How the mind-set you use for work can help you find more time for friends and family, and enjoy their company more too. People are a good use of time. As I’ve studied time diaries, and compared these schedules to people’s perceptions of time, I’ve found that a sense of time abundance rises in direct proportion to time spent with family and friends. So how do people who make time for people structure their hours to deepen their spirits? How do they build lives that allow them to enjoy this time enough to feel off the clock? In Kahlil Gibran’s book (and ubiquitous graduation present) The Prophet, the prophet instructs the people of the town he is leaving, “What is your friend that you should seek him with hours to kill? Seek him always with hours to live.” The wisdom in this is the recognition that people tend to allocate the nurturing of their relationships to whatever time is left over once the have-to-dos are done. If I can get this report done by mid-afternoon, then I’ll ask the new hire to grab coffee with me. I’ll call my friend once I’ve gotten through all these emails. I’ll ask my spouse about that thing I know is bothering her after we’ve gotten the kids to bed and picked up the house. The predictable flaw in this plan is that during the busy years of building a career and raising a family, it can feel like there isn’t a whole lot of time there for the killing. Any free hours tend to come at our lowest energy times, which makes it tempting to spend those hours on the effortless fun of TV and social media rather than on something more demanding. People who make time for people avoid this trap by doing just what Gibran suggests. They “seek him always with hours to live” by treating relationships with the same intentionality as that ultimate have-to-do: work. While people do plenty of inefficient things in the contexts of their jobs, one reason “work” seems to take more mental space than the hours alone suggest is that people think about where they’d like to be going in their work and what it might take to get there. They think about when they might do those things. Very few people treat their relationships — particularly personal relationships — with anything approaching this intentionality. This is true even if the hours might be similar. Some super-parent sorts might treat their children’s talent development with this intentionality, but that’s more of a coaching/managerial mind-set. It’s not about the growth of the relationship itself. If you make a bucket list, create three categories: career, relationships, self. Plenty of self-help books recommend thinking about your own eulogy. If you do this, picture the various people who might speak. Think about what they’d list as evidence of the close relationships you had with them. Exactly how was your affection for them apparent? If you set quarterly goals — which, incidentally, I have found to be a much more effective approach than creating New Year’s resolutions — use the same three-category rubric. Each quarter gets a career goal, a relationship goal, and a self goal, giving you twelve major intentions for the calendar year, with the deadlines nicely spread out. When you do your Friday planning for the next week, bring all three categories out again. Using a three-category list reminds us that there should be something in all three categories. It’s hard to make a three-category list and then leave one of the categories blank! While career goals are self-explanatory and most people get the idea of personal priorities (such as reading a good book), “relationship priorities” may be puzzling. We don’t think of relationship activities as goals, but they can be. Even if they were things we were going to do anyway, consciously identifying them as priorities gives them more mental space, and if the calendar is looking bare, that can be a nudge to reach out to people. Viewing relationships as their own category of time is transformative in turning these activities from something you do when you have time left over to something that happens. It switches time to kill to time to live right there. 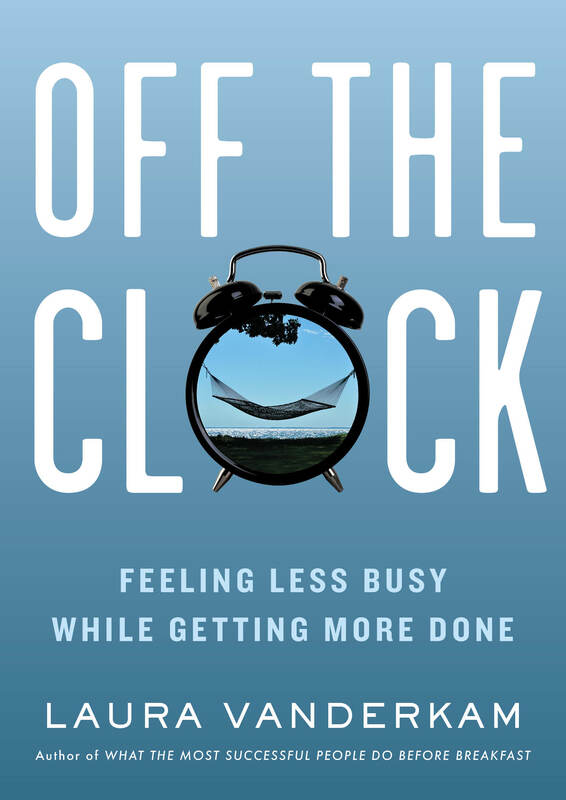 Excerpted from Off the Clock: Feel Less Busy While Getting More Done by Laura Vanderkam, in agreement with Portfolio, an imprint of Penguin Publishing Group, a division of Penguin Random House LLC. Copyright © Laura Vanderkam, 2018. Laura Vanderkam is the author of several time management and productivity books, including Off the Clock: Feel Less Busy While Getting More Done (May 29, 2018), I Know How She Does It, What the Most Successful People Do Before Breakfast, and 168 Hours. She is the co-host, with Sarah Hart-Unger, of the podcast Best of Both worlds. She blogs at LauraVanderkam.com.